Manno arrived in Nairobi from Erbil, Iraq, the afternoon of 30th November 2016. 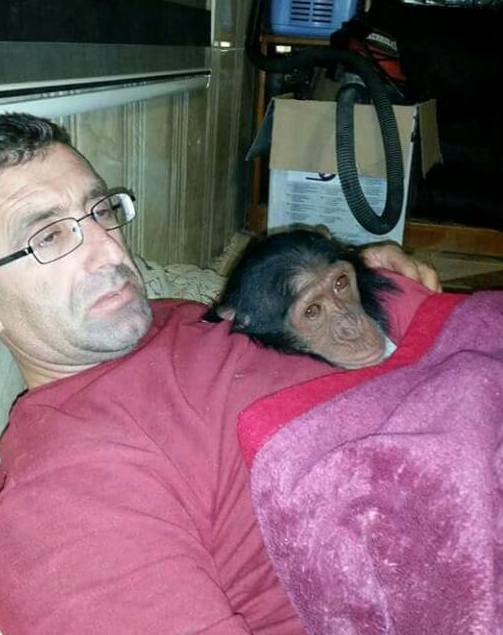 His rescue and relocation took exactly one year from the time PEGAS heard of Manno to the time of his arrival, giving some indication of the difficulty in rescuing and relocating chimpanzees across national frontiers. 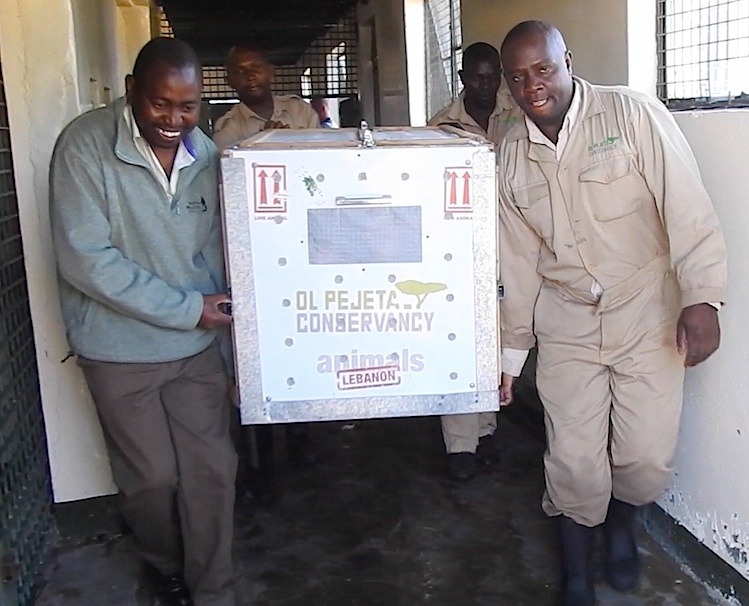 Manno was released from his 4-star quarantine room at Sweetwaters Chimpanzee Sanctuary on 31st March 2017. 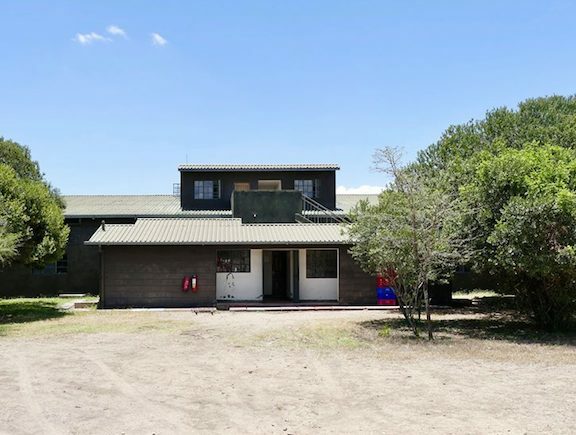 Many people were there to witness his transfer to the sleeping quarters of the New Group, where his introduction and integration process would begin. Manno remained in good spirits through it all and charmed all onlookers with his sweet disposition and amusing antics. 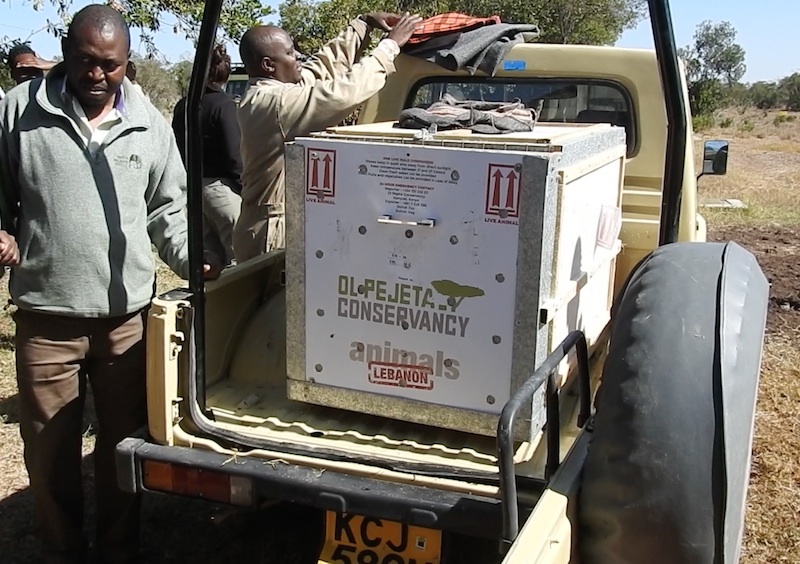 Manno’s transport crate, the same one used to ship him from Erbil, Iraq to Ol Pejeta, is loaded onto a small pickup truck. Manno looks out with curiosity, “What’s going on?” he wonders. 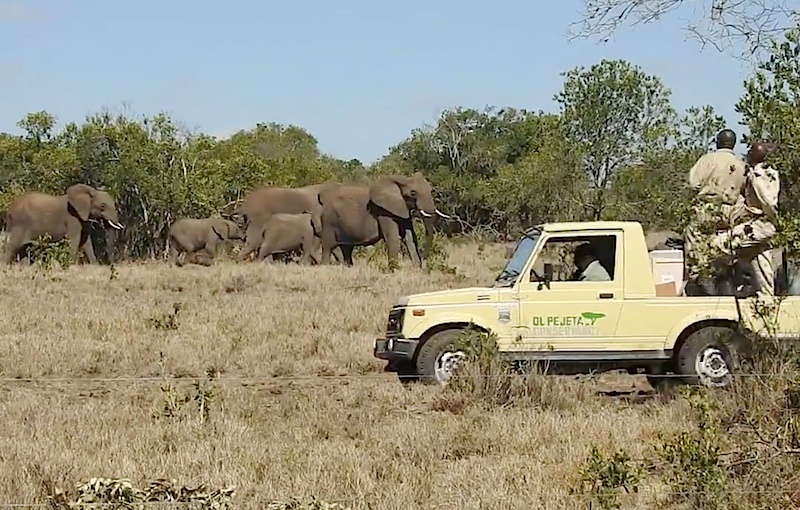 A herd of elephants greets Manno’s transporters on the way to the New Group sleeping quarters. The New Group sleeping quarters, where Manno will go through his introduction process. 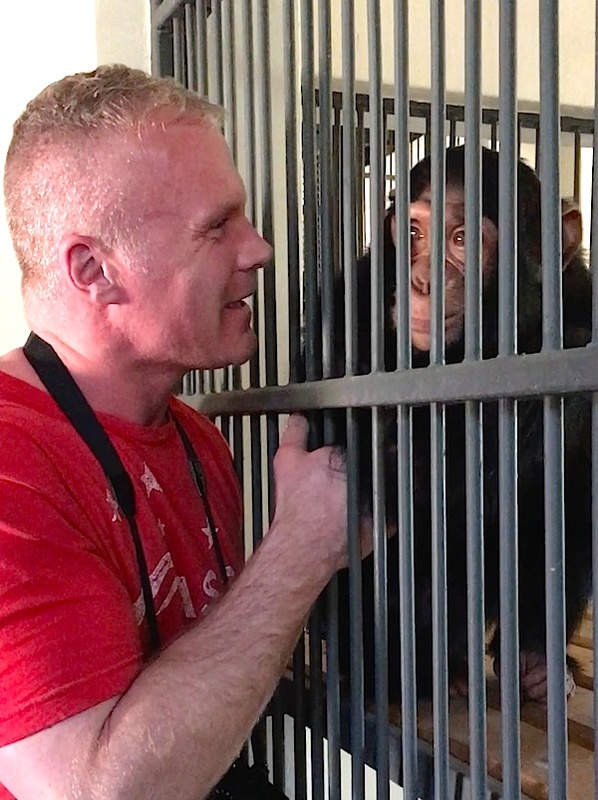 No one was more charmed and happy to see Manno come out of quarantine than Spencer Sekyer, a Canadian ex-school teacher who brought Manno’s plight to the attention first of Jane Goodall, and then of Ol Pejeta Conservancy and PEGAS. Spencer flew all the way from Alberta, Canada, to see Manno’s release from quarantine and enjoy an emotional reunion with ‘the little guy’, as Spencer affectionately calls Manno. Spencer greets Manno, whom he had not seen since early December. Spencer first encountered Manno in late 2013 while volunteering at the Duhok Zoo, near Mosul in Iraqi Kurdistan. 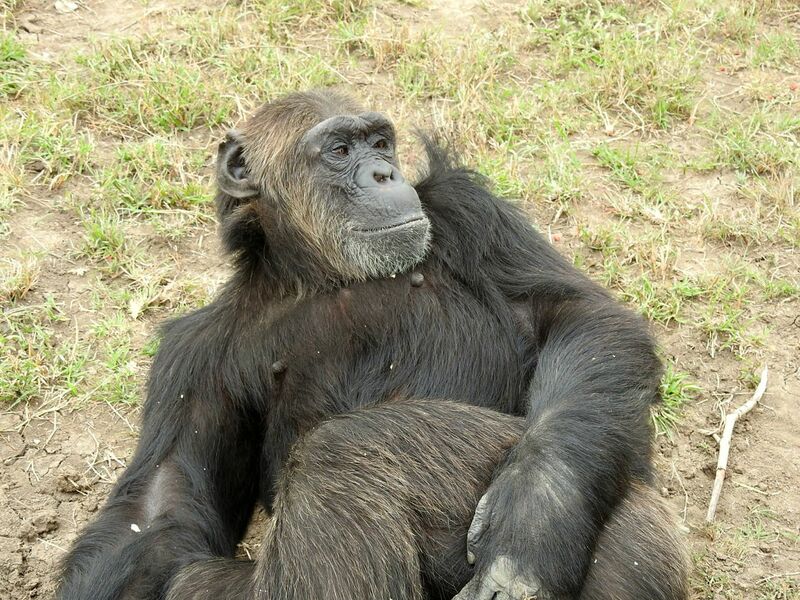 Manno probably arrived in Duhok about July 2013 from Syria and was the only chimpanzee in the zoo. The zoo owner dressed him up in children’s clothes and he generally had free reign to run around and interact with visitors. At night he slept in a small cage, except for the last few months when he was taken into the family home of a Syrian refugee zoo worker. Manno became part of the family. Manno spent the last few months before he departed Duhok sleeping with Abdul Abde and family, a Syrian refugee who worked at the zoo. The first step was to find Manno a foster mother, as she would constitute the foundation of a Sisterhood Protection Society, as it were, to shield Manno from aggressive males when eventually he would be introduced outdoors into the full group. 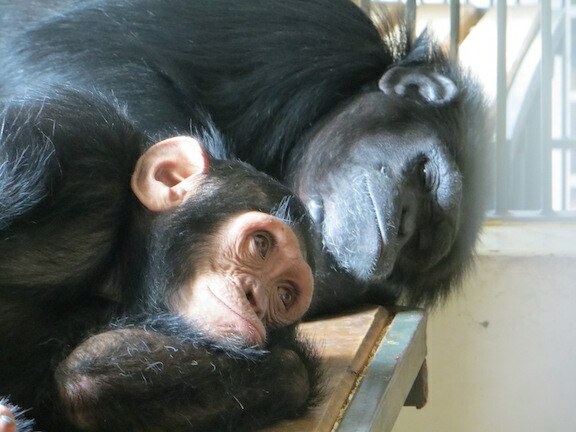 The Sweetwaters team, led by Dr. Stephen Ngulu, Manager, and New Group supervisor David Mundia, first tried Akela, a docile senior female who had previously fostered Jane, one of five chimpanzees seized at the Nairobi airport in 2005. Akela and Manno were first kept in cages with an empty cage in between, so that they could get used to seeing one another. Akela showed interest in Manno, but Manno showed only fear of Akela and of any other chimpanzee. He did not know what these strange, hairy creatures were, and their hooting and screeching frightened him, especially at evening feeding time when all the chimps were brought into the sleeping quarters. For the first four years of his life, Manno had only known human primates and he had worn clothes like them. The males in particular eyed Manno with suspicion, but his young age and small size signalled that he posed little threat to the dominance hierarchy. The cage Manno lives in looks bleak, but he is there for his protection. If he were released into the group without a lengthy habituation process, the males would kill him instantly as a foreign intruder. After a couple of weeks, Akela was put into the cage adjacent to Manno, as she showed no signs of aggression towards him, only of curiosity. 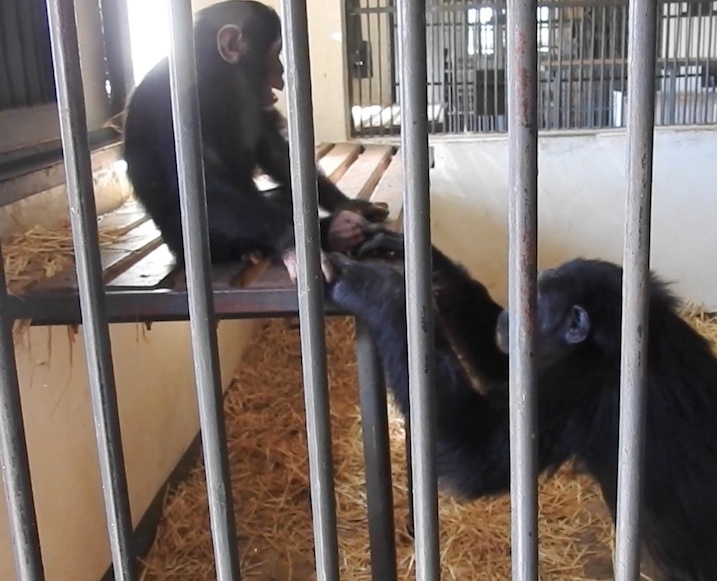 Jane, who spends a lot of time with her foster mother, showed even more interest in Manno, so Stephen Ngulu, manager of Sweetwaters sanctuary, on the advice of David Mundia, added Jane to Akela’s cage. 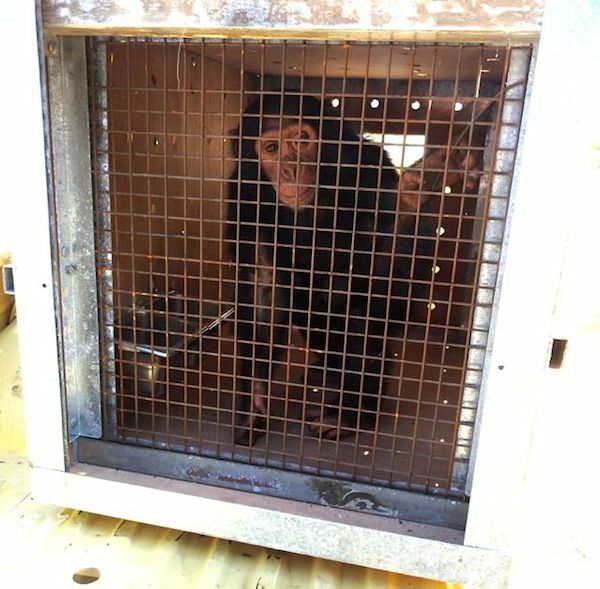 Manno continued, however, to reject their attempts to touch through the cage bars and he kept his distance. The team felt confident enough that Akela posed no danger to Manno, so she was introduced to his cage in early May. Manno ran away from any attempts made by Akela for physical contact. Finally on 13th May, Akela was switched with the much younger Jane, who is about 13 years old. Again, however, Manno would evade any attempts at contact by running away and swinging around the cage bars. The PEGAS manager just happened to be at Manno’s cage watching on 18th May when the breakthrough occurred. Jane was making repeated attempts to touch Manno and he kept scampering away. Manno was sitting on the wood platform set against the wall and Jane was on the floor, looking up at Manno. She slowly raised her arms and placed her hands on the platform, just at Manno’s feet. He watched. She gently touched his feet, then reached up and touched Manno’s head. Manno did not run away, but took Jane’s hand and went into a crouching roll off the platform, falling right on top of her. They started playing! Jane ran off with Manno chasing her. They spent a good part of the rest of the day chasing each other and play wrestling. Now Manno and Jane are like brother and sister. Stephen and David then reintroduced Akela to the cage and Manno accepted her. In late May they introduced Bahati, which means ‘luck’ in Kiswahili, so Manno now has his own little family. Bahati is a female from Burundi who arrived at Sweetwaters in 1996 at the same time as Akela. 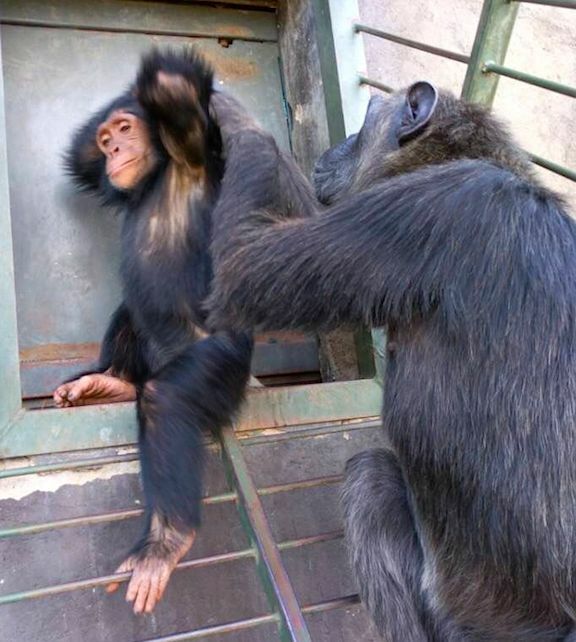 They were both victims of the illegal pet trade, so share something in common with Manno and Jane. For the first time in his life Manno is being groomed, a fundamental aspect of social life. 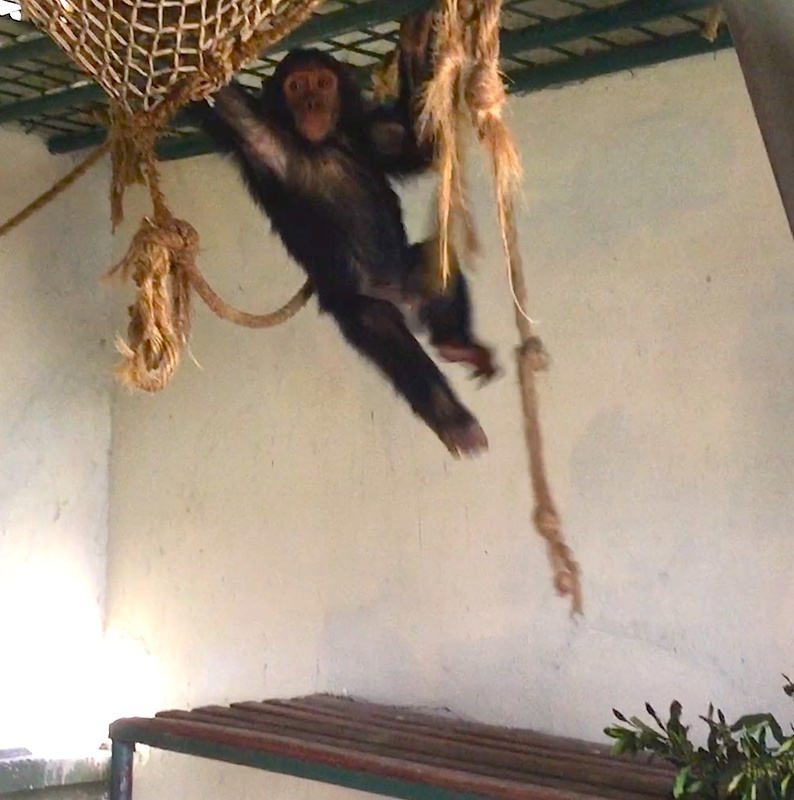 Manno is learning to become a chimpanzee. 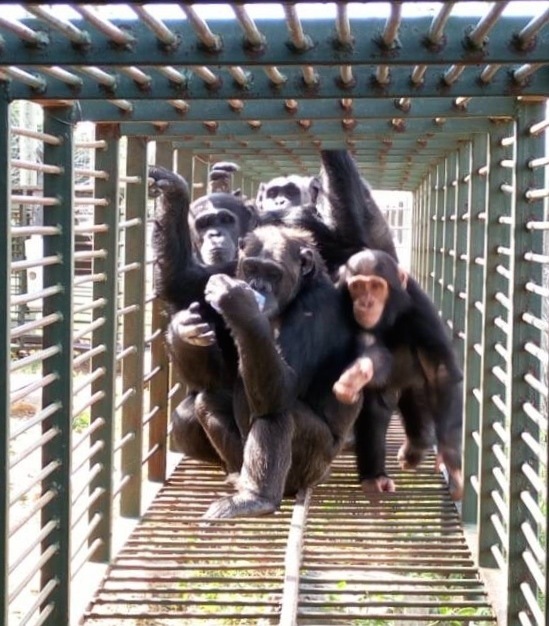 This entry was posted in chimpanzee, sanctuaries, Uncategorized and tagged Manno, PEGAS, Sweetwaters sanctuary. Bookmark the permalink.